Photo: 50 years VPF – Open Day at the company headquarters in Sprockhövel. 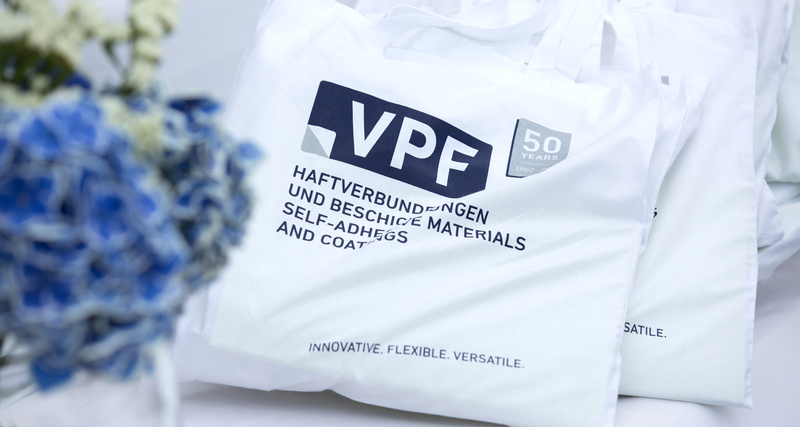 Specialising in custom solutions with self-adhesive materials and coatings, Germany based VPF GmbH & Co KG cultivates close, cooperative partnerships with its customers as a matter of principle. 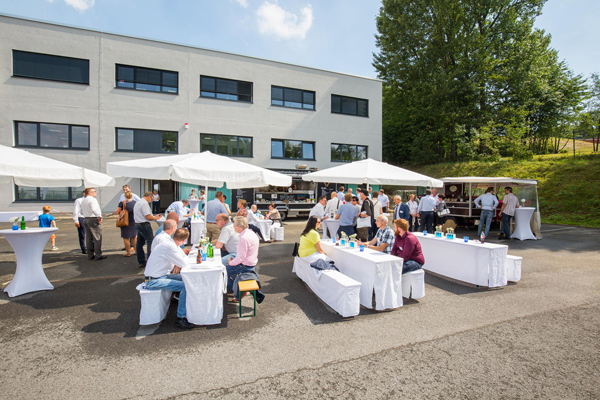 Just how good these relations are was illustrated by the informal atmosphere at an Open Day organised by the company at its headquarters in Sprockhövel in July in celebration of its 50th anniversary. Some 120 guests from home and abroad travelled to the occasion and seized the opportunity to find out all about the company on site. From the guided tours of the only recently extended Administration and Laboratory Building and the adjoining production areas, it was obvious that VPF is ideally equipped for the future. In bright sunshine, Managing Director Ralf Waltmann, Sales and Marketing Director Dr Rainer Rauberger, Technical Director Holger Steinbach and other VPF employees welcomed their guests – customers, suppliers and business partners who had come to Sprockhövel from all over Germany as well as from France, Italy, Poland, the Netherlands and Switzerland. Founded in Wuppertal in 1967, the company has now concentrated all its departments in Sprockhövel and operates successfully as a manufacturer of specialised self-adhesive materials for the self-adhesive label industry in the segment of custom product solutions. VPF’s strength lies in its fast-track development of custom labelstock materials even to non-standard specifications and supplying them starting from small minimum quantities. Customers all over the world appreciate the company’s efficiency coupled with creativity and flexibility. VPF employs a roughly 50-strong workforce. The response to the Open Day was very upbeat: “We’re delighted that so many people took up our invitation so we could celebrate together with longstanding partners in such a pleasant atmosphere. For us as a modest-sized company, such personal contacts are very important – and inspiring,” says Managing Director Ralf Waltmann, summing up. There was particularly lively interest in the tours of the plant. With business continuing as usual, the VPF Administration Building was also fully modernised in 2016 and 2017, and an extra floor was added. The additional space is now being used for new laboratories for development and quality assurance and for further sales and administration offices. 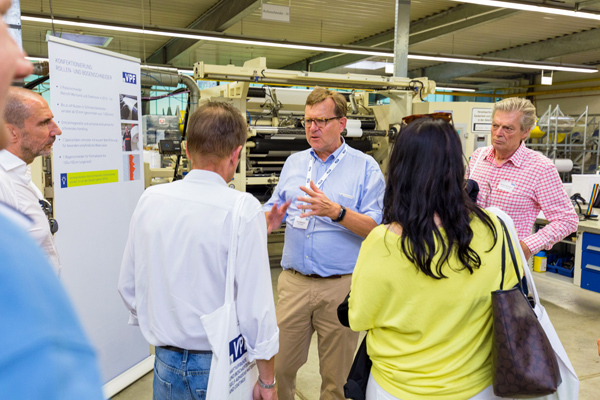 During their tour of the production shops and warehouses, guests were also able to see for themselves that VPF, with its advanced coating lines for rubber and UV acrylate hot melts and dispersion acrylates, is right at the cutting edge of production technology. “Guests were made clearly aware that VPF is both a high-performance and highly innovative partner,” says Dr Rainer Rauberger. This is illustrated by the example of digital water-based inkjet printing, where the company has recently made a name for itself with many new technical developments, as well as with seawater-resistant materials, UL-certified self-adhesive materials and security materials. With these innovations, VPF helps its chiefly small and medium-sized customers to tap new business in profitable niches. After the Open Day on the production site, the celebration was by no means over. Awaiting the anniversary guests was an entertaining evening at the historic “barn” of a nearby golf hotel where guests had plenty of opportunity to socialise over a stylish dinner interspersed with brief humorous and musical acts. The opportunity to tour the new laboratories and the whole production area met with lively interest. Managing Director Ralf Waltmann explained VPF’s production methods in the fields of coating technology and packaging. 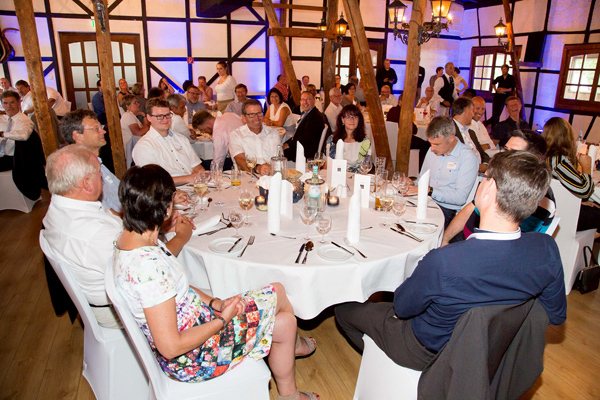 In an informal atmosphere, VPF celebrated with customers and business partners until late into the evening. A diversified programme of entertainment was provided.